Welcome back to Get Empowered! In the last Empower tip-of-the-week post for Empower CDS Software, we learned how to create a Result Custom Field (Tip #88). 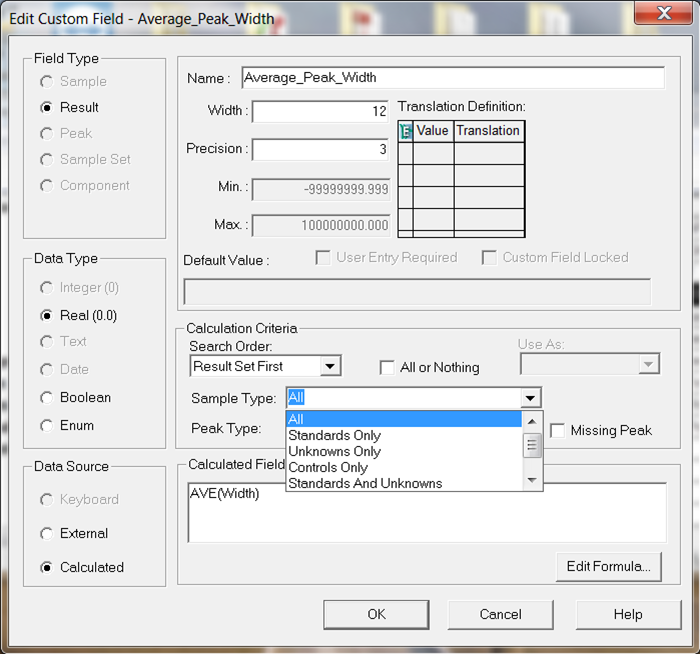 This week we will learn how to modify a Custom Field that applies to specific samples and/or specific peaks (Part 8). Please refer back to Tip #87 which covered how to modify an existing Custom Field. Let’s first review the result from Tip #88. The average peak width was calculated based on all peaks in the chromatogram, which includes Found and Unknown peaks (Figure 1). Let’s modify the Custom Field to calculate average peak width for only the Found peaks. Go to the properties of the project, Custom Fields tab, Highlight the Custom Field and click Edit. (Note: the Sample Type and Peak Type fields both default to All) (Figure 2). Click and view the choices in the drop-down list for Sample Type. We could have this calculation done for only standards or only controls (Figure 3). Click and view the choices in the drop-down list for Peak Type. In this case, we select Founds so that Empower makes the calculation for only Found peaks (Figure 4). Once you make the choice, a warning message appears telling you that the Custom Field will be calculated for only the selected peak type. Click OK (Figure 5). Once we reprocess our data, we see the average peak width value is different now that we have excluded the Unknown peak from the calculation (Figure 6). Final Notes: This procedure can be followed using the QuickStart or Pro interface. Next week in Empower Tip #90 – We’ll continue our series on Custom Fields. See all of our tips for using Empower CDS Software.